Playa Azul is worlds away from the developed beach Resorts further up Guanacaste's coast. At Playa Azul there are no salesmen, hordes of sunbathers, or noisy discos to contend with. It is the perfect place to relax all day long. At Playa Azul, visitors can wander the pristine and solitary beach, listening to the Howler Monkeys or watching the waves crash against the shore, and they can watch spectacular sunsets light fire to the sky. For activities, many travelers indulge in swimming, fishing, early morning Bird Watching, and leisurely Horseback rides along the shore. 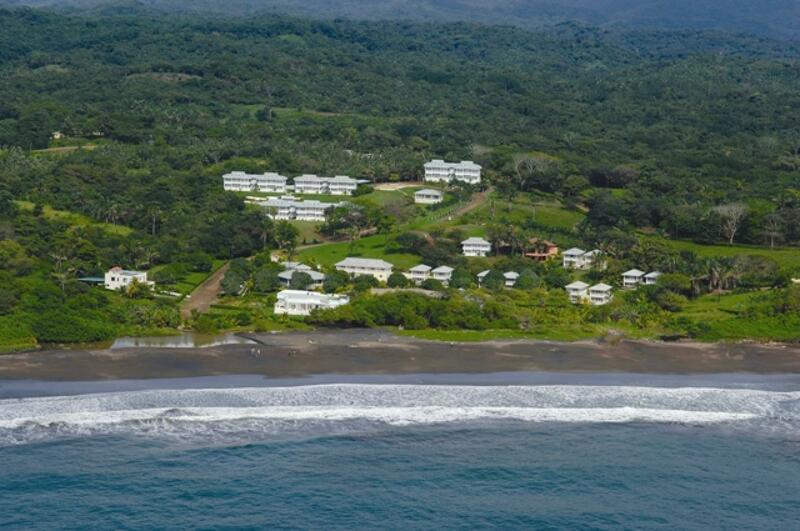 There are very few amenities located at Playa Azul itself. Yet improvements in transportation and beach accessibility have led to the development of some of the country's most upscale resorts. The beach's main attractions are its isolated, unspoiled beauty, and its accommodations at the luxurious Sanctuary Resort and Spa. The resort is an exclusive new development overlooking the ocean, and it is set amid 80 acres of protected forest with lush, landscaped gardens. The resort offers a range of accommodation options, from one-bedroom suites to condos and family Villas. It also features a health spa, infinity pool, five-star restaurant, and a range of activities that include jungle tours, kayaking, horseback riding, sport fishing, and snorkeling. Playa Azul is situated 33km northwest of Samara, between the small villages of San Juanillo and Marbella. It is accessed by dirt road from Junquillal to the north or from Nosara to the south. Four-wheel drive vehicles are strongly recommended, especially during the rainy season. A variety of other destinations are located within a short traveling distance of Playa Azul. Just a few miles to the north, the once sleepy fishing village of Marbella is now a popular Surfing destination, known for its consistent, world-class breaks. Picturesque San Juanillo lies just two miles south of Playa Azul, and it is the starting point for several sports fishing and dive charters. It is also a great place to find fresh fish and lobster! The important towns of Nicoya and Santa Cruz are situated 45 minutes to 1 hour inland. They offer all the necessary stores, as well as medical and banking facilities. Nicoya, the cultural center of Guanacaste, is home to Costa Rica's oldest church, the Iglesia de San Blas. The church was founded in 1644, and now operates as a small museum. Nicoya also houses the region's biggest and best-equipped hospital, Hospital La Anexion. Santa Cruz hosts an annual town festival in January where visitors can see rodeos, dances, music and other local traditions. A short drive south of Playa Azul lies the Ostional Wildlife Refuge (Refugio Nacional de Vida Silvestre Ostional), one of Costa Rica's most important sea-turtle nesting sites. Created in 1984, this refuge protects Leatherbacks, Olive Ridley, and Green turtles that come ashore to nest at different times of the year. The refuge also safeguards an array of marine wildlife and large colonies of birds. Turtles nest at Ostional all year round, but the peak time is during the rainy season from August to December. During these months you may have chance to witness a rare biological wonder - the "arribada." Each month, around the third quarter of the moon, thousands and sometimes tens of thousands of Olive Ridley turtles come ashore to one specific mile of the beach, where they dig nests and lay their eggs. The largest arribada ever recorded at Ostional was in November 1995, when at least 500,000 females came to nest. During the latter part of the nesting season, October and onwards, you may also see the tiny hatchlings making their way out to sea. Visitors are welcome to the refuge at any time for a small entry fee of $6. During an arribada, you are only allowed on to the beach when accompanied by a guide (extra $7 charge). No flashlights or flash photography is permitted, as it bothers the nesting turtles. "Playa Azul although remote was very beautiful. The staff was very attentive. I would recommend this resort for families, and nature lovers. Young adults may find the lack of nearby bars, and attractions offputting, but my grandsons had more fun exploring the beach and rocks surrounding the resorts. We did experience deep sea fishing and trips to nearby beaches. Had a great time and the food at the onsite restarurant was very good." Playa Azul although remote was very beautiful. The staff was very attentive. I would recommend this resort for families, and nature lovers. Young adults may find the lack of nearby bars, and attractions offputting, but my grandsons had more fun exploring the beach and rocks surrounding the resorts. We did experience deep sea fishing and trips to nearby beaches. Had a great time and the food at the onsite restarurant was very good.